Best experiance of my life. My trip to Alaska last summer was my dream vacation, but my trip to the Matanuska Glacier was the best physical experiance of my life. Honestly, I rate it just below giving my heart to Jesus. If I ever it get married I want to say my vows, right there in the middle of it. During my trip I went on a 3 day adventure tour with Exposure Alaska, with the last 2 days on this glacier. I will never forget my very first view from the van window as I yelped "IS THAT THE GLACIER?!?!?" jumping out of my seat! Looking back, I still don't believe what I saw was real. The first day we explored wearing helmets, crampons, & daypacks. It was AMAZING!! I love the crunching sound of the group with the crampons on. Blue ice, glacier streams you can put your mouth right up to and drink from because this 250 year old+ water is not polluted. These are mountains of ice! There were glacier lakes, rivers, fishers, creva`ces, and our wonderful guide Mandy taught us about everything. I was fascinated. The 2nd day we went ice climbing, ice picks and all. This was a very chellenging thing to do at first, but once you get it, you get it. I count it as one of my biggest achievments!! I want to spend the rest of my life living in view of this place. Seriously. 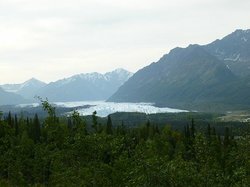 So...My trip to Alaska last summer was my dream vacation, but my trip to the Matanuska Glacier was the best physical experiance of my life. Honestly, I rate it just below giving my heart to Jesus. If I ever it get married I want to say my vows, right there in the middle of it. During my trip I went on a 3 day adventure tour with Exposure Alaska, with the last 2 days on this glacier. I will never forget my very first view from the van window as I yelped "IS THAT THE GLACIER?!?!?" jumping out of my seat! Looking back, I still don't believe what I saw was real. The first day we explored wearing helmets, crampons, & daypacks. It was AMAZING!! I love the crunching sound of the group with the crampons on. Blue ice, glacier streams you can put your mouth right up to and drink from because this 250 year old+ water is not polluted. These are mountains of ice! There were glacier lakes, rivers, fishers, creva`ces, and our wonderful guide Mandy taught us about everything. I was fascinated. The 2nd day we went ice climbing, ice picks and all. This was a very chellenging thing to do at first, but once you get it, you get it. I count it as one of my biggest achievments!! I want to spend the rest of my life living in view of this place. Seriously. 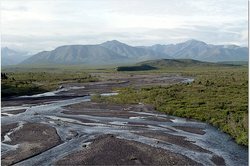 So it's like this... you can drive to this location, its considered public land, but to get the best access to it you'll need to pay a very small fee per carload. You'll eventually drive up to a cliff if you will, and park your car. There ARE restrooms in the parking area. 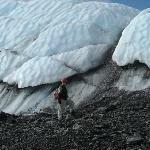 To get to the actual glacier you'll need to walk through the grey mars area, about a mile long. This is a muddy,rocky, area where the glacier has since melted back. Amazing in itself. As you get closer to the glacier you'll begin to see it transform before your eyes. What was once a crumpled up piece of blue & white paper turns into huge peakes and valleys of ice! It will get very slippery and you will need to put on your crampons and helmets to keep you safe, and literally enabling you to walk every step. We walked up and down, through, over, between, in disbelief of everything we were seeing. The temperature changes minute by minute, one minute it's sunny & you're so hot your in your hicking pants, t-shirt and vest, the next it's cloundy cold and rainy. You've got ALL your layers on, fleece, vest, hat , gloves, warm coat, RAIN PANTS & RAIN COAT! You'll need to do your research on the proper attire to where while visiting this state. Also bring a day pack. If you're going all day I recommend, your lunch, a water bottle, camera whith PLENTY of batteries and space on your photo card, a small video camera, a garbage bag to cover your bag with if it rains and so sit on while you are eating your lunch. You will freeze if you are wet, it can get very windy & cold. Zip Lock bags for anything you don't want to get wet. Chapstick and a heavy moisterizer like Burt's Bee's hand salve because your cheeks, hands, lips will get dry after a day on the ice! Also be aware that you will be going to the bathroom out there unless you plan on holding it ALL DAY so bring some TP with you. Don't be afraid to ask your guide about this! If you have to go just ask where the appropriate area is. They'll direct you to a private area. Really, not a big deal, but be prepared to pop a squat. Be aware that this is an adventurous day, you will be tired afterward. Pack LIGHT! You can go here by yourself, or hire someone to take you out. You can go for an hour or 2, or for the day. GO ALL DAY!! It was worth every penny. 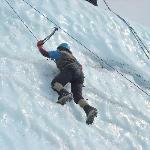 It takes 1/2 hour just to get to the glacier itself, again, pay the money and GO ALL DAY!! We used the MICA guides which were part of the tour...and they rocked! Glaciers are actually very dangerous if you do know what you are doing. There are underground streams, lakes, cracks in the ice, and so many things that could pose life threatening if you aren't aware of them!! There is even a correct way of walking that will keep you from falling. Even the treck through the rocky area is dangerous. Quick sand is a real and actual danger here. This isn't something you can read about and then go and do it yourself. You NEED someone who is familiar and aware of the actual area you will be at. Glaciers are ever changing entities that change daily. IT'S CRAZY!! Knowing we had an experienced ice guide, I was able to fully & safely, enjoy & explore this incredible world if ice. 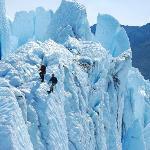 If you are visiting this area the Matanuska Glacier is a MUST DO EXPERIANCE! I can never fully explain to you how wonderous, amazing, ming blowing, beautiful, unbelievable, life changing this place is. It will be the focus of my trip when I return..and I WILL return! Since we were driving west on Hwy 1 during the july 4th weelend, we decided to stop here and see the Glacier. Unfortunately, we didn't have mosquito nets and we walked about half a mile into the trail to see the glacier, but couldn't with all the mosquitos. It was like a wall we ran into. The Ms found every bit of exposed skin to settle on and bite. In short, please get mosquito nets and repellants before attempting this short hike. 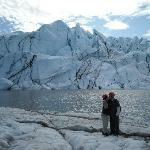 Try the Knik Glacier tours, this is much more approachable. We did a full day with MICA, having Jeff from New Zealand and Lauren as our guides. We got to climb to our hearts content the entire day. Jeff is a very accomplished climber and mountaineer and we felt safe the entire day knowing he was the one tying the knots. This was such an awesome experience that we would recommend it to anyone who has a day free in Alaska. Great experience with MICA Guides! We range in age from 9-79. We did the glacier hike with MICA guides. We decided to do it that very morning, and so we arrived a bit late. Everyone was helpful and kind, and didn't make us feel bad or put pressure on us. They outfitted us completely and reassured us that the older members of our group would be fine. Our guide Liz was kind, friendly and helpful. 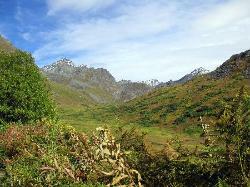 We had a great hike, a very memorable experience, with lots of great photo ops. Highly recommended for all ages! This was exciting because my husband has never been on a glacier. I am from Alaska so I have hiked on a few glaciers, but this was fun for me. We had our 18-month-old daughter in tow and the hike was just fine for her. 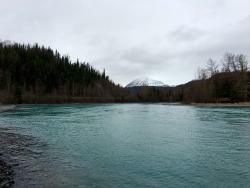 This is an easy hike for anyone and we enjoyed it as a day trip. I totally felt like it was overpriced though. We paid $15 per adult, which is silly. 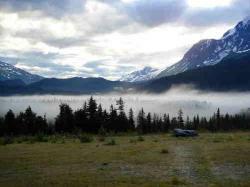 We paid it simply because we had just drove a number of miles from Anchorage where we live. They should have discounts for Alaskans, for sure. But it is a good walk especially if you have young children. We would have offered pictures but we forgot our camera! This is a good day trip simply because of the scenery. I recommend this to anyone looking for something to do during a beautiful summer day here in Alaska. 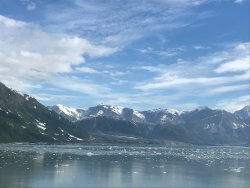 Glaciers are amazing and offer plenty of history, so it was enjoyable for us to experience it! A guide would be very helpful if you would like to experience the glacier further, as the regular hike doesn't take you very far. We chose the 3-hour tour, which may have been a bit too long/repetitive, but the alternate 1.5 hour tour would have been too short, I think. We paid $70 per person, plus a $15 per person glacier access fee (all paid right to MICA using a credit card). 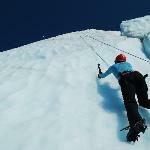 They outfitted us with helmets and crampons, which were easy to use and not at all clumsy. (There were times later in my trip that I wish I still had them with me.) The trek was very easy; nothing too taxing physically. Although we began at ground level and ended up a good deal above sea level, I never felt as though we were climbing at any significant rate. We saw lots of ice formations and crevasses that were very interesting. Our guide, Andreas, took lots of photos of us. We had some light rain/drizzle, but I wore a "Deadliest Catch" Red Ledge rain suit that worked tremendously. Sun glasses would be a must on a bright day because of the glare. I would recommend at least the 1.5 hour tour for an interesting peek at the glacier.